Pirates not welcome here! That was the message U.S. District Judge Terrence W. Boyle delivered Thursday, March 23, 2017 to the North Carolina Department of Natural and Cultural Resources (NCDNCR), its employees and the Friends of Queen Anne’s Revenge in response to their motion to dismiss a Federal Lawsuit brought by Nautilus Productions. 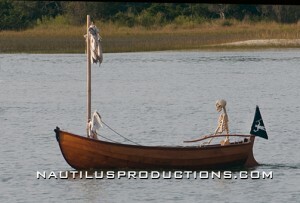 Nautilus, the official videographer of Blackbeard’s pirate ship the Queen Anne’s Revenge, brought suit at the end of 2015 alleging the defendants made illegal copies of Nautilus’s videography, and then persuaded the legislature to pass an unconstitutional law – now known as “Blackbeard’s Law” – in an attempt to justify pirating decades of work from Nautilus. Judge Boyle’s decision allows the lawsuit for copyright infringement and for a declaration of the statute’s invalidity to move forward in Federal court. This lawsuit arises out of the retrieval of Blackbeard’s pirate ship. According to the complaint filed in the case, the defendants were not content to use the videography as agreed and began making unauthorized copies, covering up their misconduct and passing and amending legislation to protect their copyright infringements. Defendants in addition to the Governor and the State include employees of the Department of Natural and Cultural Resources, and the Friends of Queen Anne’s Revenge non-profit. The Friends of Queen Anne’s Revenge dissolved their corporation after the lawsuit was filed and are being defended by their insurance carrier. 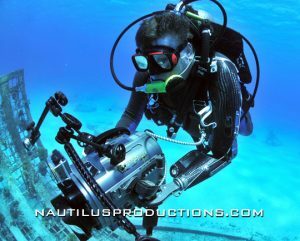 Since 1998, Nautilus Productions has been the official video crew for the Blackbeard’s Queen Anne’s Revenge Shipwreck Project. Nautilus Productions has documented almost two decades of archaeological activities and the recovery of artifacts from Blackbeard’s infamous shipwreck for the benefit of, and at zero cost to, the taxpayers of North Carolina. The shipwreck, discovered in 1996 by Intersal Inc., filed separate lawsuits against the state of North Carolina and the Friends of Queen Anne’s Revenge, which continue in the State Office of Administrative Hearings, State Business Court and the North Carolina Supreme Court. UPDATE: April 21, 2017 – The State of North Carolina, Kevin Cherry, Stephen R. Claggett, Karin Cochran, Roy A. Cooper, Cary Cox, Susan Wear Kluttz, John W. Morris, Susi H. Hamilton, D. Reid Wilson, G. Neel Lattimore, Catherine A. Oliva & North Carolina Department of Natural and Cultural Resources file an interlocutory appeal of Judge Boyle’s decision. Nautilus files a cross appeal. A hearing date is set for March 20, 2018 in the United States Court of Appeals for the Fourth Circuit in Richmond, Virginia. On December 1, 2015, the videographers who have spent almost two decades documenting the retrieval of Blackbeard’s pirate ship, the Queen Anne’s Revenge (QAR) filed a Federal lawsuit against Gov. Pat McCrory, the State of North Carolina, and others, in the U.S. District Court for the Eastern District of North Carolina. The lawsuit filed by Nautilus Productions, LLC and its owner Rick Allen alleges that the recently passed “Blackbeard’s Law” is unconstitutional, and that the defendants have infringed copyrights owned and licensed by Allen and Nautilus, violated other federal laws, and engaged in unfair and deceptive trade practices. Defendants in addition to the Governor and the State include employees of the North Carolina Department of Natural and Cultural Resources (NCDNCR), and the Friends of Queen Anne’s Revenge nonprofit in Beaufort, NC. The plaintiffs include; Susan Kluttz, Karin Ramstad Cochran, Kevin Cherry, Cary Carr Cox, Stephen “Steve” Claggett and John “Billy Ray” Morris. This is not the first time the State has been in trouble over the project. Earlier allegations of copyright infringement resulted in a 2013 Settlement Agreement, and payment of $15,000 to Nautilus and Allen as compensation for copyright infringement. Then, in August of 2015, Blackbeard’s Law was passed, stating that videos, photos and other documentary work in the State’s possession are now “public documents” and that there are no restrictions on their use. It also said that any agreement to the contrary would be invalid. Just weeks after that signing, NC DNCR posted videos and images that illegally incorporated Nautilus’ digital media and violated Nautilus Productions’ registered copyrights and intellectual property rights on its State Government Social Media Archive. “It is outrageous that the agency charged with promoting the arts in North Carolina does so through the misuse of its citizen’s property. 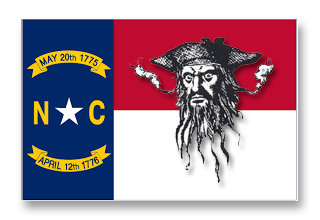 Blackbeard’s Law affects every artist, writer, photographer, producer, historian and donor in N.C. and sets a dangerous precedent for N.C. government overreach,” said Allen. 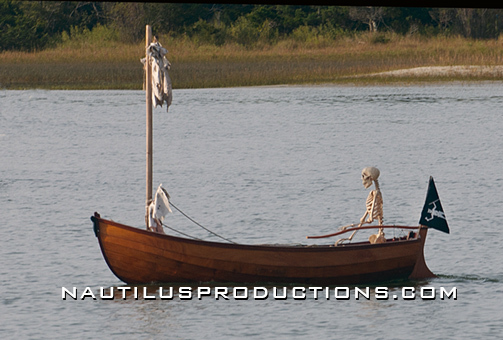 Since 1998 Nautilus Productions has been the official video crew for the Blackbeard’s Queen Anne’s Revenge Shipwreck Project. During that time Nautilus Productions has documented on video archaeological activities and the recovery of artifacts from Blackbeard’s infamous shipwreck for the benefit of, and at zero cost to, the taxpayers of North Carolina. According to State Archaeologist Steve Claggett, Rick Allen of Nautilus Productions “has worked energetically and enthusiastically in conditions that often are unfavorable, uncomfortable, and challenging for diving, filming, or anything else. Rick is totally professional and a great companion for our research crews, visitors, and media representatives. When viewers see underwater footage of the Blackbeard shipwreck site on local TV, or in documentaries by UNC-TV, the BBC, History Channel, Discovery Channel, or others, that footage was shot by Rick Allen.” This footage has been provided to scientists, researchers and the NC Maritime Museum for its Queen Anne’s Revenge exhibit at no cost to NC taxpayers. Literally hundreds of media outlets and broadcasters have incorporated Nautilus’ footage in news stories, videos and documentaries seen around the globe, again at zero cost to NC taxpayers. Nautilus Productions LLC is represented by Derek Shaffer and Todd Anten of Quinn, Emanuel, Urquhart & Sullivan, LLP, Susan Freya Olive and David McKenzie of Olive and Olive, P.A. and Joe Poe of the Poe Law Firm, PLLC. UPDATE: March 14, 2016 – The Friends of Queen Anne’s Revenge nonprofit in Beaufort, N.C. registered it’s destruction filing with the North Carolina Secretary of State and was officially dissolved. Another lawsuit against North Carolina, filed by Intersal, Inc. which found the Queen Anne’s Revenge, is pending in state business court, the N.C. Office of Administrative Hearings and the North Carolina Supreme Court. The change dropped the “no limitation on the use of or no requirement to alter any such photograph, video recordings, or other documentary material, and any such provision in any agreement, permit, or license shall be void and unenforceable as a matter of public policy” section of the law. UPDATE: On March 23, 2017 U.S. District Court Judge Terrence W. Boyle rules the lawsuit for copyright infringement and for a declaration of the statute’s invalidity will move forward in Federal court. After an appeal of his ruling, by the State of North Carolina, a hearing date is set for March 20-22, 2018 in the United States Court of Appeals for the Fourth Circuit. UPDATE: July 11, 2018 – 4th Circuit issues an unfavorable ruling in case and declines petition for en banc appeal. Nautilus adds Quinn, Emanuel, Urquhart & Sullivan, LLP to its legal team in preparation for petition of a writ of certiorari with the Supreme Court of the United States. UPDATE: January 4, 2019 – Nautilus Productions LLC files a Petition for Writ of Certiorari with the Supreme Court of the United States. Copyright Alliance – The Copyright Alliance is the unified voice of the copyright community, representing the interests of thousands of individuals and organizations across the spectrum of copyright disciplines.